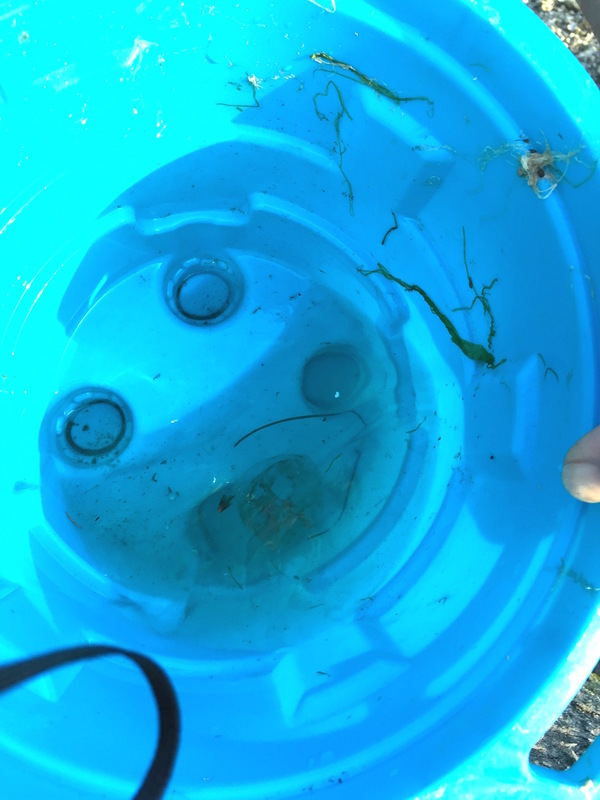 What you can barely see in this bucket is a clear, moon jellyfish. This thing was about 3 inches in diameter, and easy to see in the bucket if you were there…not so much on a picture. Last night we went to the beach with the kids to play in a little inflatable boat and wade in the water. I keep forgetting it is saltwater, because from where we are it looks like a lake. But saltwater it is, and it is sticky and a little grimy; most certainly not lake water. However, the discovery of hundreds of jellyfish floating merrily next to the kids’ legs may have been a good time for the jellies, but it did not go over well with the kids. At all. One in the water panicked, and started swimming into deeper Sound (had to turn him around and direct him onto the shore). Another cried all the way back to the car out of fear of death by moon jellies, and most of the way home. And the rest were generally grossed out during the ordeal. Finally, one fell on the beach and scraped both knees on barnacles, and was a little bloody mess. Some beaches here are so covered in barnacles it is impossible to walk in flip flops…boots are kind of an absolute must, especially on this beach, in particular. We placated the situation with Happy Meals and showers. I am grateful the kids are still young enough that this still works.